Something a little different for us today, something I don't do enough but I had the perfect occasion and targets to do so this time : scenery. The excellent Chris from Fogou Models has offered a couple of friends and myself the possibility to paint some of his upcoming models and I have to say after painting the brilliant shacks he had done earlier, I was more than excited to put my brushes on more of his work ! The main feature of those new pieces are the ruins of a farm. It's building made of rocks that can just fit in most settings you could think of. The 2 parts come with a wooden floor which is removable so I took the liberty to make an alternative floor from Pcard and textured sheets. With the same footprint, this was an quick way to tech the building up a bit. So all in all that's 25 pieces of ruined stone walls and buildings to make the ruins of an ancient farm or anything you like. It's versatile and full adaptable. Painting was pretty straightforward and I got inspired by my mate Ced's scenery expertise. I'd like to highlight once again how amazing the casts are, very few to no flaws or bubbles of any kind, no flash or mould lines or whatever (except in the windows but it's cleverly designed to have some there), the resin could almost be painted right from the package (no release agent to remove) and the material has a very soft touche while being very strong and fine as the level of details shows. The texture do most of the work honestly so Kudos to Chris for a truly remarkable job. The parts were all undercoated black with a bit of dark rd spray at the bottom (to represent dust). Then I sprayed grey with an angle from above and finished with very light touches of white spray. The second step was to gently drybrush everything with a mix of light grey and ulthuan grey. After that, I glazed some stones in different colours (using GW washes in thin even coats) and finally drybrushed everything lightly with Ulthuan grey. 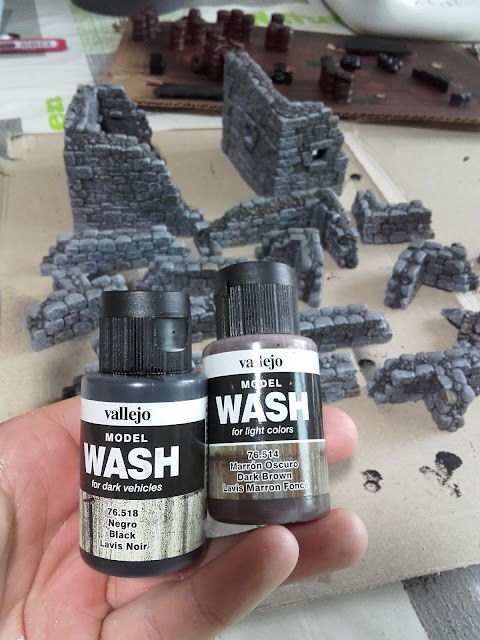 Now the last step was advised to me by friends so I used some of these washes to do the rubble in the walls and between the stone on the ground parts. 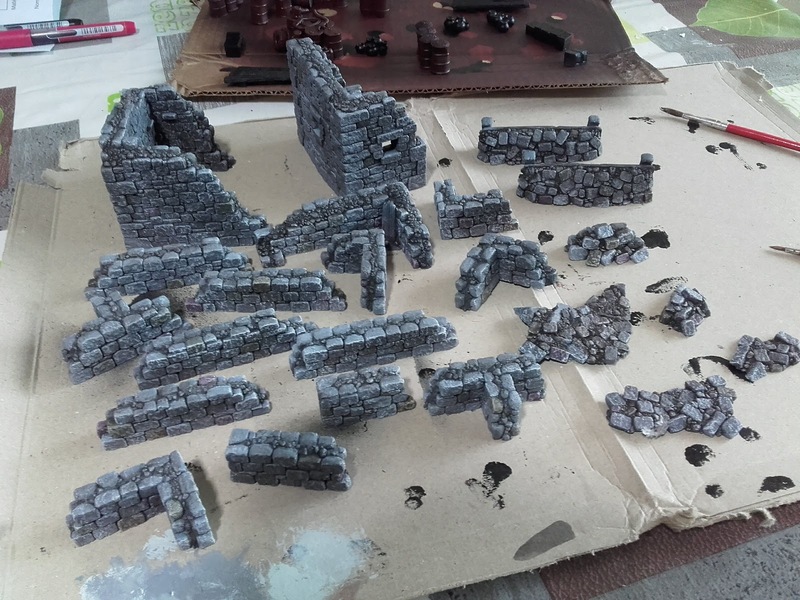 I also thinned them and applied some around corner stones, windows, and anywhere I wanted to create a bit of shadow. I also applied some in randome areas to break the even colour of the walls. The technique I used was pretty rough, after applying the wsh I would just rub the excess off with a tissue or just my fingers and I think it just works a treat. Those washes flow like inks but without the shine and with less pigments. I honestly think they're going to become a must for all my scenery and probably some other uses for models. I'm not getting any money from anyone I've said good things about in this post but sometimes you just have a great time when painting nice stuff with nice tools ! And here's the result of one afternoon of painting ! Now of course, old habits die hard, tell me about farms and I'm immediately starting to think about battles. Just how great could a battle at the farm be huh ? There's more coming from Fogou and this place and I have to say the rest is up to the excellent standard already set by Fogou so watch this place and go check their site. April is going to be one busy painting month (with some Kendo competitions in the way) but May is going to be pretty gaming oriented so who's complaining ? Certainly not me ! I like the fact that the walls are wide ans strong, the different tones you used to paint them do perfectly fit as well. An afternoon well spent. Never heard of Fogou Models before, I'll definitely have a look at their range. Cracking work. I like your conversion with the bonus flooring. Great trick adding extra shadows — it really enhances the depth of the pieces. Relieved your colour choice is a radically different to mine! For scenery just like for models, I need to push contrasts so those shadows really helped along a zenithal lighting which forces perspective. I'm looking forward to seeing yours ! Superbes décors, réalistes et parfaitement faits! Merci, je les recommande vivement, c'est un vrai plaisir à peindre et avoir en main. Is that gobbo on the last pic is based on one and only Grom the Paunch? Yes it is, it's a model from Knightmare Miniatures sculpted by no other than Kev Adams the Goblinmaster ! I really like how the swapping out of the floor pieces changes the context and tech level of the pieces. With limited space and budget, this type of flexibility is helpful. It really is, with added scatter terrain, it will make all the difference. Thanks for the recommendation about Fogou, and double thanks for the step by step instructions on how you achieved that lovely gradation of colours on the stone. Those instructions were inspired by some great guys so I'm happy to spread them ! Nice paint work on some good looking pieces. I like how you made those swap-able floors, as intended it really gives you some more options to use the terrain. Very easy to do and it does make a difference ! Very nice stonework indeed. You've avoided the age old 'boring featureless wall' look with all the washes and variations in colour. 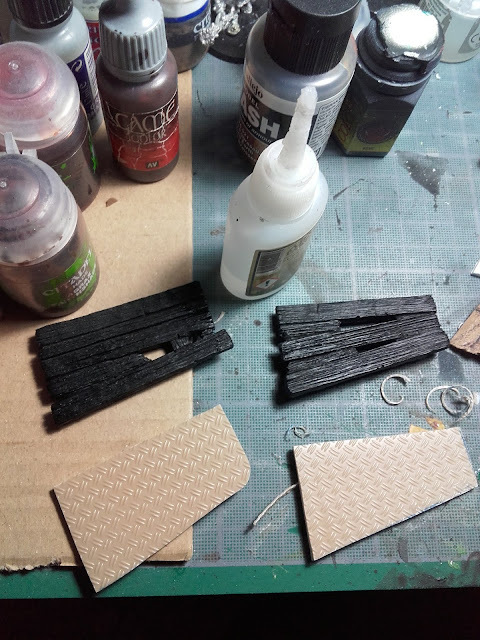 I particularly like your metal decking upgrades - did you glue the textured plasticard to some thicker sheets? I wanted to do something more elaborate with plastic girders but just stuck some textures sheet on some thick Pcard indeed ! Terrific. I love how natural those stones look! The sculpts are really helpful to achieve a natural look. Looks great JB. I've always resisted the diamond plate plasticard as "too big", but it seems to work well. Might I suggest mutant sheep and a crazed farmer with a Neural Disruptor for your Battle at the Farm. Brian added that and it was weirdly glorious. The walls look so realistic. Brilliant work! Cheers ! I owe it to the excellent sculpting which did most of the job really ! Well I've had the opportunity to use them a few times already and they're great ! Scatter Terrain from Fogou !